Transfer Commodes - A Simple Solution To Elderly Toileting! Transfer Commodes - slide on over. 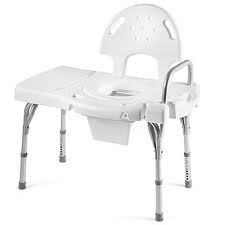 Transfer commodes are generally made with a metal frame with the same washable, removable bucket and side arms that you can drop for the transfer. These toilet bedside commodes are nice when your patient is non weight bearing, too heavy to transfer or is just plain unsafe to try to stand to transfer. An added plus is the padded sliding part and seat, however, too much padding can make sliding difficult. These commodes can be partially disassembled to accommodate transferring to the left or to the right. Some also sport different bells and whistles depending on how much you want to pay. All (should be) are adjustable for various heights. In my experience, it is easiest raise the transfer commode to a height that is in between the highest your electric or crank bed will go and the lowest it will go. When transferring TO the commode, raise your bed higher than the commode allowing gravity to assist your transfer onto the commode. When transferring back to bed, lower the bed below the level of the commode so gravity can assist you back into bed. You may have to play around with height adjustments to find what works for you. These commodes can be as wide as the bariatric commodes but for the purpose of providing a surface to slide or scoot on over to the seat. Because they are intended for more of a sliding transfer, this commode is not meant to be moved around (unless the transfer part is not needed anymore). Check on weight limitations before using this commode as a bariatric commode. Again, our mission is to help you do it yourself at home - to inspire independence. Consider learning more about the top three exercises to help anyone at any ability level regain strength and flexibility.